It’s been a year since I got myself the Remarkable paper tablet and it sure has changed my workflow and productivity for the better. I’m a big fan of the pen and paper combo, and the way that the ReMarkable has combined that experience with the versatility of added tech-based features make this device my absolute favorite. The Remarkable was launched as a Kickstarter campaign by a Norwegian start-up company in 2017. It’s meant for “Paper People”, promising an authentic paper experience with the added benefits of portability and organization. Before getting my ReMarkable, I used to experiment with different planners and notebooks, such as the Midori Traveler’s Notebook with its removable fillers and customizable pages, and the classic Filofax that lets you move the pages around and reorder the pages. They both worked for some time, but I stuck with neither of them in the long haul. I found the largest available Midori too small, and having to change the fillers every month felt like a chore. The Filofax also seemed promising at first, but I found it to bee too bulky for my taste. The size of the pages also didn’t hit the sweet spot for me. Then came ReMarkable. With its minimalist aesthetics and ergonomically-designed 10.3” frame, I thought it could be the perfect size for a note-taking device. I also found the roomy screen and the e-ink technology to be a good fit for my leisure and academic reading needs. I’m currently doing my Ph.D. and I consume academic articles almost every day, so a device that faithfully renders graphics-rich PDF files was a must. If you’re interested in how I use my reMarkable tablet as a Ph.D. student, then read on! Here are the top three tasks I use it for. We all know too well that the most brilliant of ideas can creep up on you in the most random of times — while washing the dishes, drinking coffee, or taking a shower. Because this sudden dash of genius strikes in the least expected situations, it’s important to have a system that not only records it but also makes it a lot easier to pull up later on. That’s where the reMarkable really shines in my opinion: the ability to group all your thoughts into neat bins so you don’t have to lose them ever again. It is a file organization system as much as it is a note-taking device. My process looks like this: when a random idea pops up, it goes into a notebook labeled “Brain dump” nested within my Ph.D. folder. I usually manually add the date and time for good measure. Then when I find myself having the time and energy to deep dive into it, I go back to that notebook and develop these ideas further by drawing diagrams and concept maps. I love the freedom that the reMarkable gives me in this process of trial and error: I can guiltlessly start a fresh page and draw as many diagrams as I need until it “clicks”. The fact that I can have multiple brain dump notebooks for different areas of my life also work in my favor: I have a career-focused brain dump notebook and another one that houses my photography notes and photowalk reflections. Through the rM, I can wear my many hats and shift between them without losing my mind. Thanks to its authentic pen and paper feel as well as different pen styles and sizes, I’ve found the writing experience really enjoyable and something that I look forward to. Pure bliss. A big chunk of my work as a researcher involves devouring articles and books almost on a daily basis. Even after installing Mendeley — a text organization software — on my tablet and laptop, I still craved for the experience of jotting down notes and ideas as I digest dense content. This led me to accumulate piles of printed articles which led to tidying struggles and guilt over using more paper than I should. Since I got my reMarkable, I haven’t printed out a single article. Yes, that’s right. Not even one. If I really need to deep dive into an article, I simply load it up on my device and nerd out. I use the highlighter to emphasize important ideas and use the regular pen function to circle key words and add my own ideas along the margins. I found it to work well with shorter articles (up to 25 pages). For longer books with multiple chapters, you might find it too sluggish even with the go to page and table of contents functionalities. To stay on top of everything, I also have a dedicated folder for daily journaling. I have since adapted a method that serves my needs, and this typically includes a monthly overview of tasks and a habit tracker. I combine this analog system of tracking with my digital everyday productivity workflow with the Todoist app. At the start of each month, I create a monthly spread on my reMarkable. It includes a section for milestones, important events and appointments, and an academic writing habit tracker (I adopted the Twitter hashtag #acwri as a heading for my daily writing goals). All the daily tasks like working on a specific part of a manuscript or transcribing a certain interview goes into Todoist. I opted to delegate daily tasks to Todoist since I find it to be very intuitive and simple when it comes to task migration and moving things around. I leave the more stable and unchangeable elements to my analog reMarkable flow. In other words, I use the reMarkable as a guide to make sure I’m making enough progress or that I’m hitting my thesis milestones, while the Todoist app helps me focus on the smaller steps to get there. In addition to this monthly spread, I also have a log of daily highlights and habits in another page, inspired by this minimalist approach to journaling by Michael Korzonek. Basically, the idea is to use squares to represent each day of your life, which you’ll then fill in with the day’s highlight (a short phrase in the middle) and some habits you’ll want to track. As for me, I’m currently developing three habits: academic writing (represented by a shaded box in the lower right corner), meditation (star, upper left), and exercise (shaded circle, upper left). Journalling like this on the reMarkable is a fun way to be more productive. In the past, I used to beat myself up for misspelling labels and lopsided borders and these mundane details got in the way of me actually getting things done. Having the rM solved that for me, since making the journal aesthetically appealing becomes less of a chore through its arsenal of drawing tools like pens (I love the brush pen for lettering and mimicking calligraphy strokes) and the added functionalities of erasing, rotating, resizing and duplicating elements. There is also a perfect template for every need and mood, including lined, dotted, or blank pages in portrait and landscape formats. While the rM is certainly a far-from-perfect niche product, I am totally impressed by the authentic experience I get each time I pick it up to think, write, and work. 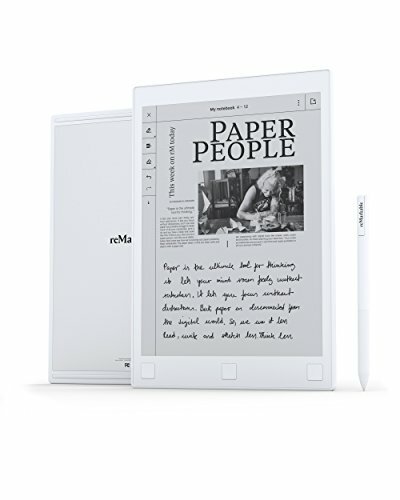 If you are a paper person looking to become more productive, organized, and focused in your workflow, then the reMarkable tablet may just be the right device for you. You can get your reMarkable tablet on Amazon or through their website. 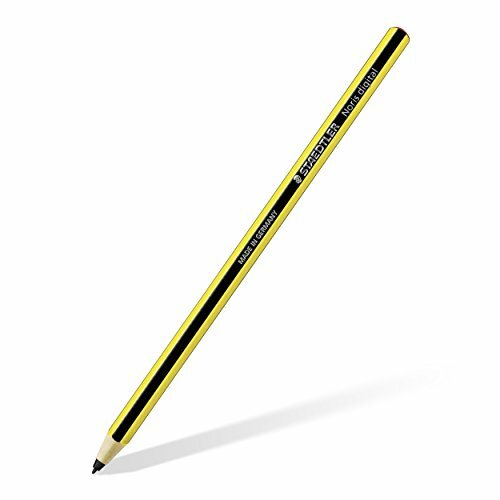 You can also pair your rM with this very cute Noris Digital stylus available in two colors (yellow and green). I’ve had it for a month and still swoon over it! It is a great backup or alternative to the original stylus that comes with your rM purchase, since the Noris Digital is cheaper, its tips last longer, and it’s more protected. The rM stylus works fine but the tips wear out more easily and it’s prone to rolling off uneven surfaces because of its perfectly cylindrical shape. The rM sure has many pre-installed templates to choose from, but even its wide range of options isn’t enough to satisfy my inner creative. Cue the einkpads template installer, and I now have my dependable, tried-and-tested, hand-drawn, handwritten, customized monthly spread page ready to load. Setup is as easy as downloading the Mac or Windows installer on your computer, connecting your rM to it via USB, filling in some information regarding your device on the pop-up screen, and dragging and dropping your template as a .png file. If you need a quick walk-through on how to get it up and running, just watch this short instructional video. Aside from the template installer, they also have a screen customizer that lets you change your rM’s standby screen image as well as a range of art, design, and productivity templates. I hope you found this post helpful, whether you’re still on the fence about getting the rM or just plain interested in making the most of your device. We’d love to hear about your experience using it for study or work in the comments section below!